Rapper Stevie Stone has a new music video up featuring Tech N9ne, “Midwest Explosion”. Stevie Stone, from Colombia, Missouri, is signed to the Eazy-E founded Ruthless Records, and toured with Tech on the K.O.D. Tour. The video is dope, showing live performance clips of Stevie and Tech doing it big across America, and features a recurring shot to the two in front of the K.O.D. van. 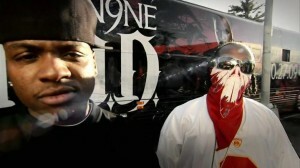 Tech rocks it as usual, sporting a bandanna-mask and his custom Tech N9ne Chiefs jersey. The rest of the Strange Music crew also makes an appearance: Krizz, Kutt, Scoob, and if you don’t blink, you’ll even catch Brotha Lynch Hung wearing a “Jason” mask, taking it off for a split second, giving the audience a quick peek of the “Coathanga Strangla.” As if that wasn’t enough of a star line up, the rap group Slaughterhouse makes an appearance–with Joe Budden, Crooked I, Royce Da 5’9, and Joel Ortiz all making cameo appearances. Watch here or below.